Ready To Sidestep Heartbreak For Good? If you’ve felt unlucky in love, there’s a good chance you’re not lined up with your Soul’s major intentions for your life. When you get that right, you can turn bad luck in love into a bounty of lasting passion! If you’re so satisfied with your achievements that you are no longer willing to make any effort to grow or improve, don’t expect much from life. “Resting on your laurels” is a bad formula for life, love, or the pursuit of greater happiness. But if you choose to reach for new goals – to grow, expand and become more of who you are… you can expect a life of greater excitement, more love, happiness and satisfaction. What IS A Node, Anyway? 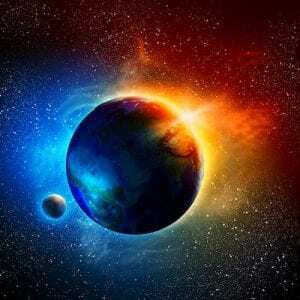 The Lunar Nodes in your astrological chart are not heavenly bodies but locations in space. They are the two points where the Moon’s orbit crosses the ecliptic (the apparent path of the Sun, as we see it from here on Earth). The Lunar Nodes are exactly 180° apart. One of them is called the North Node, because it is rising above the ecliptic. The other is called the South Node because it is descending below the ecliptic. In astrology, the North Node represents the qualities and characteristics your Soul is wanting to grow into in this life. While the South Node represents the strengths you have already mastered. Heartbreak Is In The Forecast! So if you set up your life to make it “easy” by focusing on “South Node” careers, activities and relationships, what you’ll find is that things tend not to work out very well for you. Hopes, dreams and aspirations seem always out of reach. Plans fall through, deals fall through, and when it comes to love… heartbreak is surely in the forecast! On the other hand, when you choose to focus on developing new skills, talents, and relationships that embody the qualities of your North Node, you’ll find that doors open easier, unexpected opportunities come your way and yes, your love life can improve immediately! In plain English, what this means is that their Soul’s both wanted to grow away from a natural ability for being “center stage” (Leo), and toward being in service to the highest good (Aquarius). The thing is… one of them chose to “rest on his laurels” (South Node), while the other took up the task of cultivating his North Node Soul Calling by using his natural ability to lead and be center stage (South Node in Leo) to serve Humanity (North Node in Aquarius). Can you figure out which one of these men focused on which Node? If you guessed that Gandhi focused on his North Node, while Elvis rested on his South Node laurels, you’d be right! Because while there’s nothing wrong with being the “King” of Rock-n-Roll, let’s face it: Gandhi was the one who aided an entire nation. 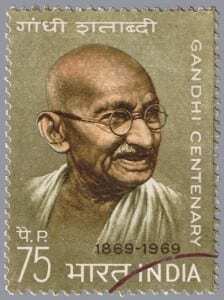 And if that doesn’t convince you, consider this: When you think of Mahatma Gandhi, what comes to mind? Things like: Noble Leader, Principled spokesman; Global Role Model for Peace and Non-Violence. Now, consider Elvis. What comes to mind? While he was an enormous influence on music, he also died an overweight, prescription drug addicted, sad man. A man who did not properly develop his Soul’s unique growth calling. In Love (but) All Shook Up? When it comes to your ideal relationship then, if you’ve been looking for love that appeals to your South Node, you’re probably fed up with picking Mr. or Ms WRONG… right? That’s because these South Node-oriented relationships emphasize the old, the stagnant, or the working out of old karma. Strong South Node connections with your lover might feel familiar, safe or comfortable to start. Shoot, they might even feel electric, passionate and irresistible! But they’re not necessarily lifetime relationships, and they’re much more likely to turn stagnant or sour. Once you’ve completed your “karmic dance” with an old, South Node lover, the relationship is often complete. Choose to cling to it and expect to suffer. If this sounds like you, then it’s time to refocus on your North Node. Relationships with important North Node connections are soul growth relationships. They can be challenging too, but ultimately serve to expand what your SOUL is wanting for you in this life. Carol is a Vedic Astrologer and Relationship Coach of many years. In fact she’s renowned as a “Relationship Coach To The Stars” and for helping people finally find their ideal mate. Carol has put together a very special report which she’s made available to our Numerologist community. So whether you are ready to find “the one,” figure out if he or she is “the one,” or simply want to add more fun, connection and trust back in your relationship, I know you’re going to love this report!